Many of you have asked me for advice, help, or an opinion on the dipping trend that has swept the nail industry again lately. In order to offer troubleshooting, I needed some experience and education. In order to have a fair opinion, some firsthand knowledge was needed. Here are my thoughts and some hopefully helpful hints for those of you who offer the service. The class that was brought to my attention was for the Artistic Nail Design system. The educator was a respected industry friend, Jennie Sukovaty, whom I was excited to support by purchasing a ticket for the class. No matter the brand of nail product used, it’s important to support local education as much as possible in order to continue being able to find local education. The class was fun and the educator was engaging. If you are already using a dipping system, here are some notes I took in class that might help you with troubleshooting. Please feel free to share any additional troubleshooting information you may have in the comments! The powders need to be shaken very well before each use. Shaking breaks up the pigments and distributes them more evenly. Polymerization, or cure, will happen faster in a warm room and slower in a cold room. 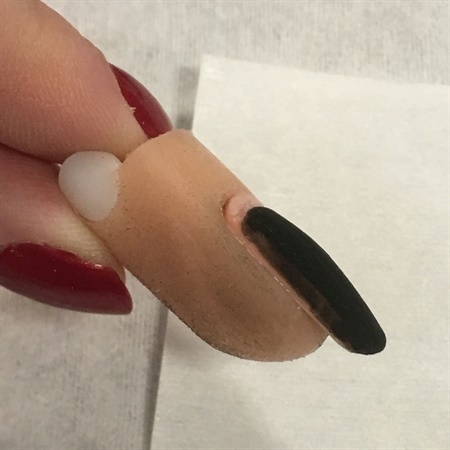 When product or color seems to be missing from the sides of the nail, check that you are getting an even coverage of base coat all the way to the side, while still not touching the skin. Lumps or smudges are an indication of base coat that has been applied too thickly. Next comes some information that I acquired from Doug Schoon, after several professionals either commented on the Facebook feed from class or messaged me, concerning the finger in the powder issue. According to Doug, “While a polymer powder may not encourage bacteria growth, an active infection could be spread through the powder.” The important point here though, is that this is actually a regulation issue, not an opinion issue. If you are going to look into offering a dip service in your salon, you will need to find out if your state has policies against double-dipping. Double-dipping can include putting the same person’s finger back in, as well as more than one person’s. This is where you will need to take the responsibility of looking up the state board law instead of taking the word of any manufacturer, since it will be you who pays the fine should it ever come to that. If your workaround for the double-dip situation is to pour, make sure that you are not pouring over the top of, or back into, the powder jar as that would still present the same issue. Finally, for my personal thoughts. While I appreciated the class and think Artistic Nail Design has good products, this is not a trend I feel the need to follow in the salon. When I was fresh out of school, Backscratchers offered their dip system and, as a professional who struggled to achieve a fast, quality enhancement service, it was perfect for me to learn and grow a clientele. Dipping offers a brush-on method that can be done with good polish skills and does not require mastery of mix ratio or nail structure. It is similar to gel-polish in that the shine must be removed from the nails before application, and the top coat seal must be filed for removal. Because the dip itself is a polymer powder, the client enjoys strength similar to a liquid and powder (acrylic) enhancement, without the same time commitment or odor. This makes it ideal for beginners, a spa looking to offer something stronger than gel-polish without the odor of liquid and powder or light cure of gel, or those looking to take advantage of client requests for a current trend to build a book. 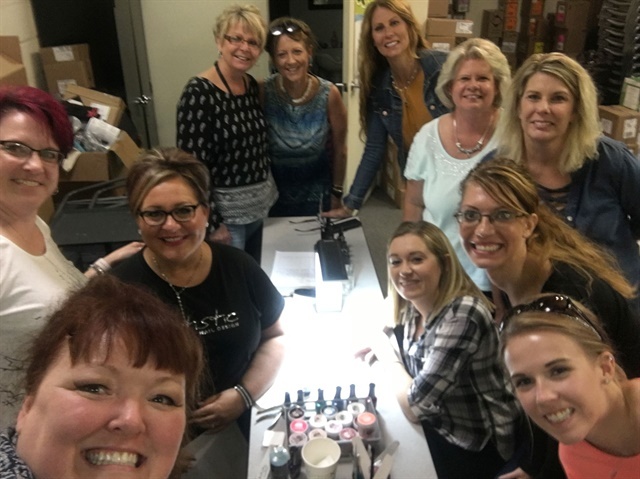 In short, as with any nail service, it is your own personal preference, budget, and skill level that should determine the products you try or offer. If you are curious about the dipping service, at $60 for a six-hour class and intro kit, Artistic Nail Design is an affordable way to have a look.